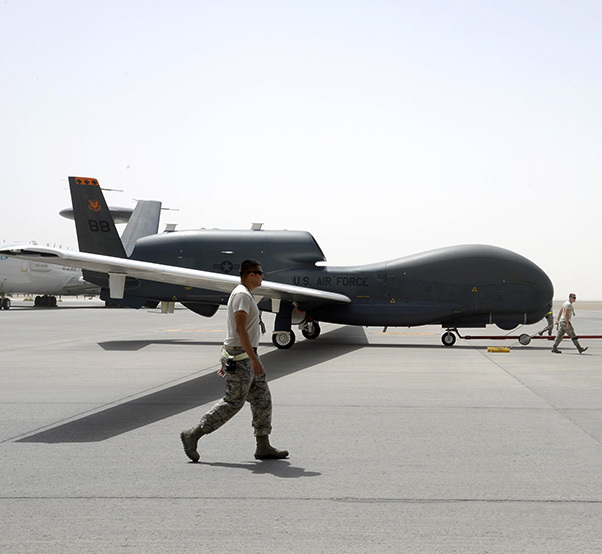 Airmen from an RQ-4B Global Hawk aircraft maintenance unit welcome an RQ-4B after a flight in 2015, in Southwest Asia, in which the aircraft surpassed 10,000 flying hours. When outfitted with communications capabilities, like the Battlefield Airborne Communications Node, a fleet of three redesignated EQ-4B Global Hawks provide clear, precise and reliable communication for Joint and Coalition partners in the Central Command Area of Responsibility. The Battlefield Airborne Communications Node will reach 10,000 combat missions within the next month, hitting a significant milestone just as the program office here works to expand the current fleet to eight combat-ready platforms. 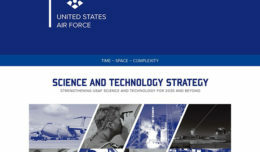 Considered a weapons system, BACN is an information sharing gateway providing multiple aircraft of varying generations and ground-based troops with standard, secure communications. BACN operates on two platforms. The E-11A modified Bombardier and the EQ-4B Global Hawk both operate in the Central Command area of responsibility, providing over-the-horizon secure communications bridges for troops and combat aircraft. The Global Hawk has executed nearly 1,700 combat missions using BACN and the E-11A has executed 8,300 missions. Recently, AFLCMC began working an urgent need for another Global Hawk capable of wielding BACN. Currently, the fleet stands at four E-11s and three EQ-4B global hawks. Helfrich says his Airmen are working to get that count up to four EQ-4Bs by fall of 2017, for a total fleet of eight BACN-equipped aircraft. With a combat air force the oldest it’s ever been, many disparate communications systems are built into platforms which rolled off the line across four decades. During 16 years of continuous combat, the U.S. military finds itself responding to challenges posed by providing safe, reliable communications across multiple generations of aircraft and other weapons systems. Ground troops rely on combat airpower, and clear communications enables their success. The Air Force contracted Northrop Grumman to create a secure, smooth communications system allowing troops to talk to fighter and bomber aircraft during Operation Enduring Freedom. BACN was fielded in 2009. The first combat mission was flown over Afghanistan in December 2010. Now, the system executes four to five combat missions a day. 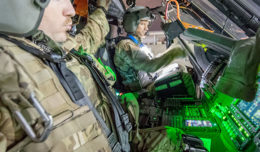 AFLCMC exists to respond to the needs of the warfighter, and provide them with weapons systems capable of accomplishing many different types of missions. When U.S and coalition warfighters note increased requirements, systems such as BACN can be modified, using the urgent operational needs process. According to Helfrich, the urgent need for additional BACN airframes can be traced directly to successful use downrange in support of joint and coalition partners.